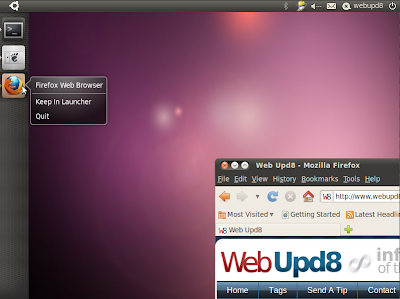 Unity has finally been uploaded to the Ubuntu 10.10 Maverick Meerkat repositories, until now being available only in a PPA for Ubuntu 10.04 Lucid Lynx. The version in Ubuntu 10.10 is 0.2.7 and the one in the PPA 0.1.38 (a lot older), yet there aren't too many improvements. In fact there's no visible improvement, only regressions: there's no search bar anymore and the Expose effect no longer works - but this might be due to the fact that if you install it in Ubuntu 10.10 desktop (not UNE), it doesn't create a new entry in the GDM login screen and you must start it manually. You may want to move the top panel to the side as it will cover the Unity panel.